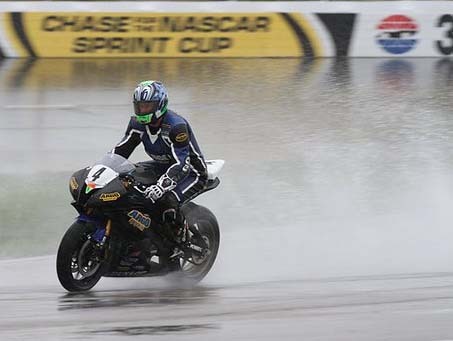 When championship winning motorcycle racer Scott Greenwood of Dunbarton, New Hampshire talks about racing, his eyes light up. He speaks excitedly, he relishes in the telling of every detail, and you can tell he has no shortage of enthusiasm and passion for what he does. Engines, racing, and speed run in Greenwood’s family. He grew up in the Manchester area and began his riding career on dirtbikes. His brother Bill began road racing in 1989, and was the one responsible for getting Greenwood involved on the sport. In 1999, his oldest brother Dale also started road racing along with his nephew Marshall, and way back in the day, Greenwood’s father was actually a NH State Go Kart Champion and did a bit of regional and national kart racing in the 1960’s. 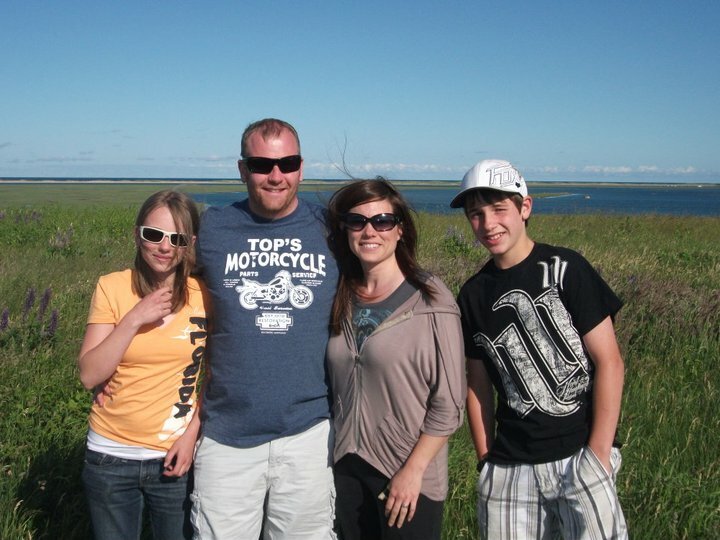 From L to R: Daughter Kelsie, Scott, wife Heidi, and son Samuel. Greenwood’s first motorcycle was a 1987 Honda Hurricane CBR600. “My brother bought it as a parts bike; it had been in a street bike crash and the front end was bent so bad the front wheel hit and broke the motor.” With help,Greenwood got the bike back into riding condition and rode it from his home in Manchester to Freedom Cycle in Concord where he was working at the time. When the weekends rolled around, off came the motorcycle’s lights, and it was turned into a weekend race bike. Having a supportive family is an important element when pursuing a passion full bore, and Greenwood is fortunate to have just that. His wife Heidi, fifteen-year-old daughter Kelsie, and his thirteen-year-old son Samuel travel to Scott’s races as often as possible, and Samuel is actually turning into a promising rider himself. It’s easy to see that motorcycles and racing are a part of the Greenwood family, just like they were when Scott was growing up, and the whole family are all engaged and involved in helping this dream grow and be successful. Greenwood’s home track is the New Hampshire Motor Speedway in Loudon, NH. (A little fun fact, Greenwood is second on the all-time list of most championships won in the track’s history with 38.) NHMS is also home to the Penguin Racing School where Greenwood has been an instructor since 2010. 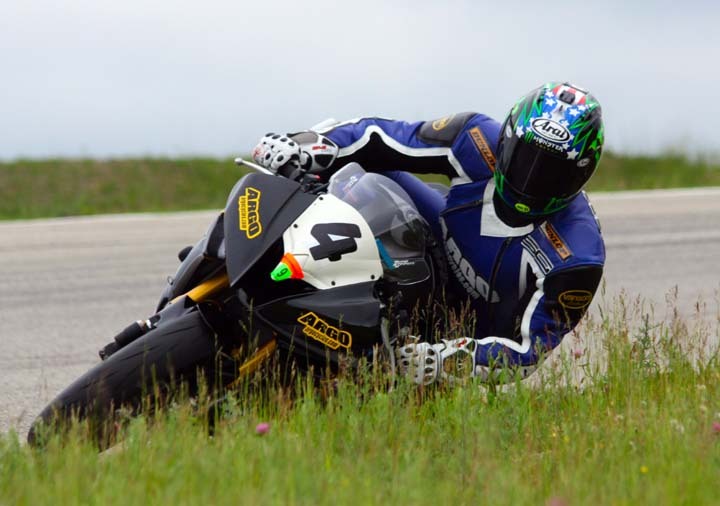 He brings his substantial racing knowledge to the Track Experience program offered by the Penguin school and he helps riders of all levels get their first taste of track riding. “It has been very rewarding, and it’s refreshed my attitude about racing. Seeing a new guy start out and get hooked is exciting. People who take the school are always smiling when they leave.” Riders of all levels learn body position, what their motorcycle is capable of, fundamentals in a classroom setting, how to read the different flags and corner worker signals, etc. Be sure to check out the Penguin school’s websiteand learn about all their classes, track days, and other events. How would you describe what’s it like racing a motorcycle? What makes racing in NH different than racing in other states/tracks? Is there anything that makes NH riders different? 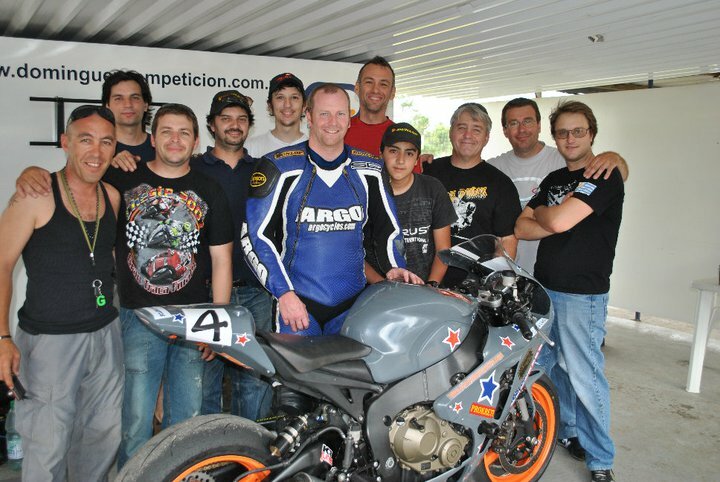 Definitely one of the most unique experiences of Greenwood’s career is when he had the opportunity to participate in a race in Uruguay in December of 2010. The following quote was taken from an Argo Cycles press release before Greenwood headed down to the race. The press release can be found on RoadRacingWorld.com. While you’re there, be sure to check out the other articles on Greenwood’s victorious racing exploits. “This was a very rare opportunity that I could not resist. Back in October, the owner of Argo Cycles asked if I would be interested in racing this event in his home country of Uruguay. 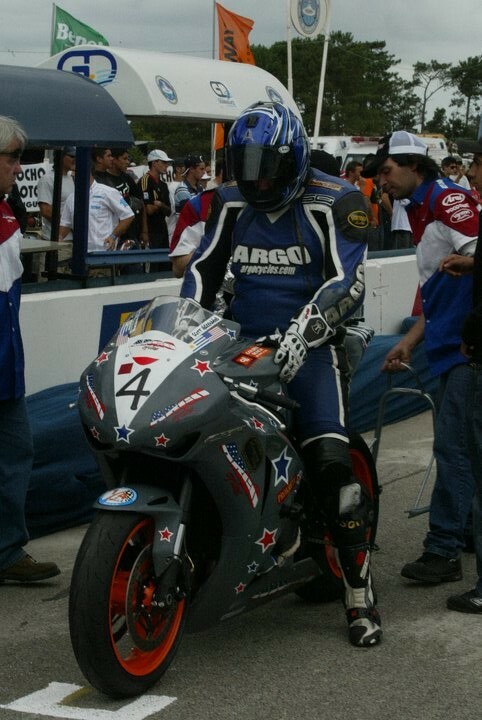 We put together a shipment of parts to use…Miguel Orpi, a long-time customer and friend of Argo’s has assembled a nice racebike for me to use… National Championship rider[s] from Argentina, Brazil and also racers from Uruguay will be in attendance. 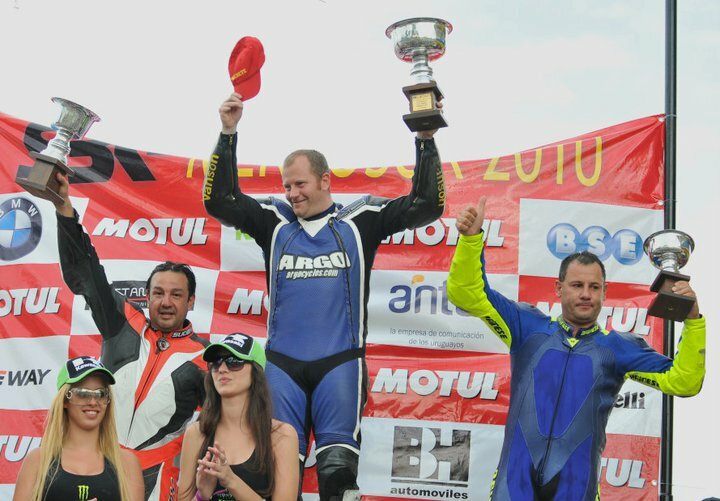 It looks to be an exciting event for the fans of Superbike Racing in Uruguay. 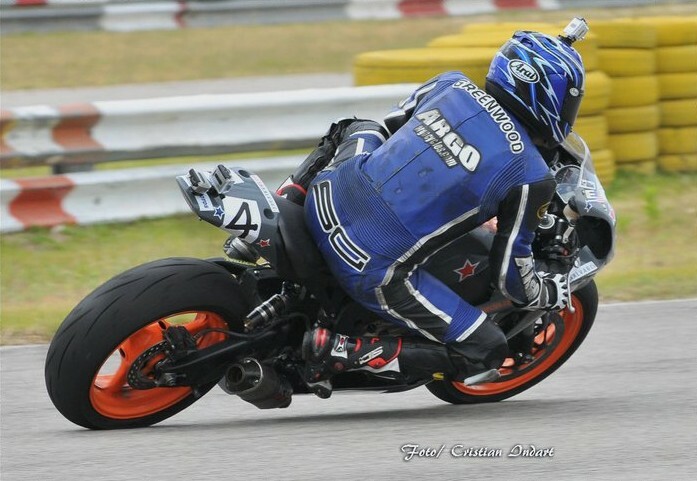 It was an epic event and Greenwood ended up taking first place in the Superbike Elite class, and placing second overall. Greenwood was something of a celebrity when he was down there. His name appeared on posters, he was asked to do a radio and a TV interview for media from Uraguay and neighboring Argentina, and the South American President of the FIM (a world level sanctioning body for racing) commented on the significance and importance of his involvement in the race. Welcome, Scott Greenwood, to The Torque Tube. Great Article Doran! Loved reading all the new content, looks great! Thank you, Dave! The article was a blast to write. I appreciate your support buddy!